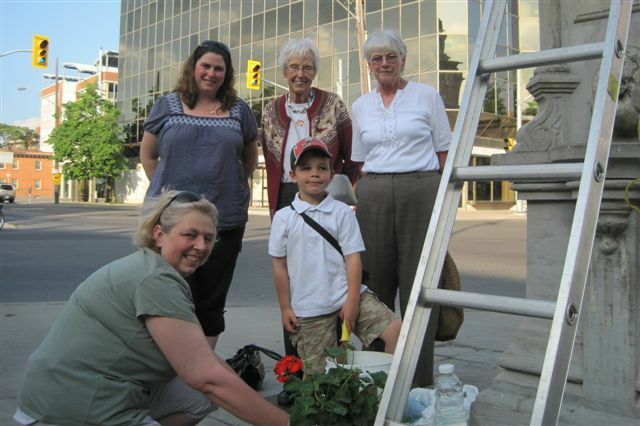 Each year the Historical Society holds a ceremony where a geranium is planted on the top of the Oille Fountain in downtown St. Catharines. This is done in commemoration of the donation of the first public drinking fountain in St. Catharines by Dr. Lucius Oille in 1878. This is the 36th annual ceremony. 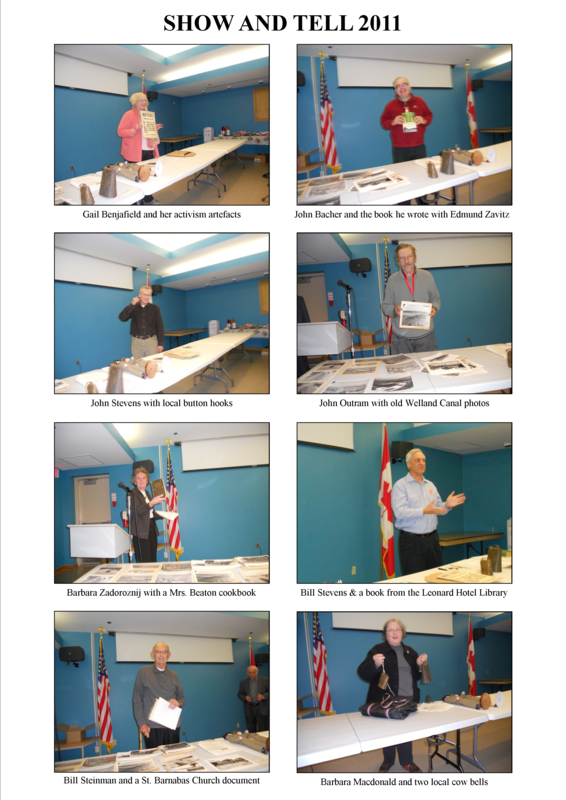 Once a year, the Historical Society encourages its membership to look in their basements, closets and attics for some treasures to share with the rest of the community. The interesting records and artefacts that are brought out are always interesting and triggers many memories and stories. Here are some images from the November 2011 Show and Tell Day. 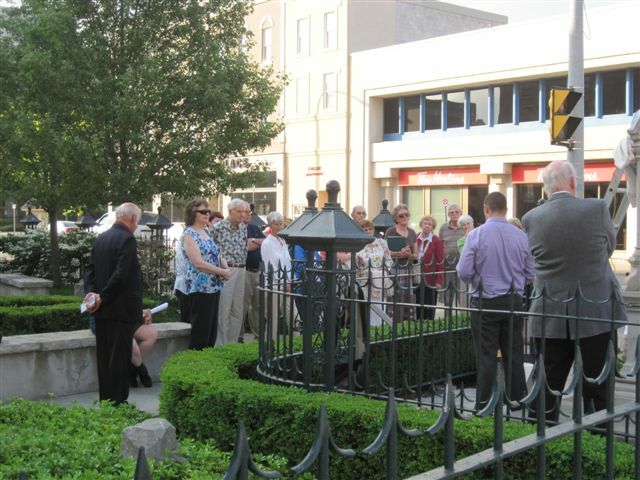 Each year the Historical Society holds a ceremony where a geranium is planted on the top of the Oille Fountain in downtown St. Catharines. This is done in commemoration of the donation of the first public drinking fountain in St. Catharines by Dr. Lucius Oille in 1878. This is the 33rd annual ceremony and descendants of Dr. Oille were in attendance. Photos provided by Maurice Gomme. John Burtniak presiding over the ceremony. Geraniums in place atop the Oille Fountain. Inscription on the Oille Fountain. Hello – I am trying to find out where records from circa 1945 are now held from the United Church that was located at 97 Church St., St. Catharines. A am also searching for contact information for records from all Unitarian churches in St. Catharines in the late 1930s. Could someone give me any information on the name of the canning factory that was on the corner of Lake st and James St in st. catharines and when it closed it became a hotspot to teenagers to dance called the Castle. The tragedy is…St Johns West went into decline in the 1850s (or before)…right when photography was taking off. To my knowledge, there’s only one extant photo taken in the village, and that was in the early 1900s. The photo shows the woolens store on Holland Road, previously Fell’s general store. If anyone knows of other photos, please reply. Where did all the of the Grantham records go from 1860 to 1960? They are missing from all archives. 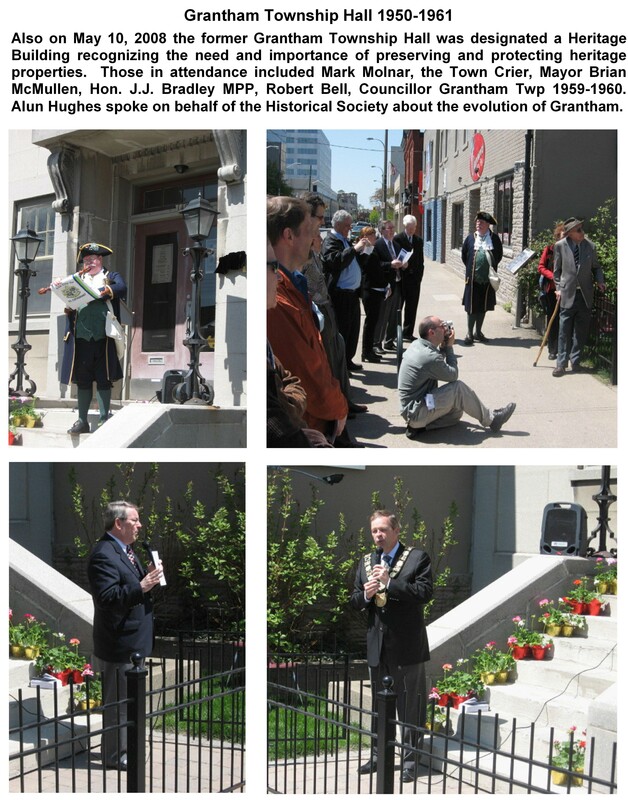 The St Catharines official story is that they were destroyed by the Grantham dwellers at the time of amalgamation. I find that very difficult to believe that is the case, these records detailed very personal land and property details. Any ideas? I own the Seymour farm house and am trying to piece its history together. Hi, I”m trying to find information and perhaps a picture of the Lincoln County Home (Industry and Refuge) when it was a working home and farm for the poor. Thanks kindly. I am looking to find out where the initial house area was of James Johnson who had about 300 acres in the wellington street area at the early st catharines family. They intermarried with the Boyle family who may have been on Duke Street, otherwise, his family also was in merriton and his toolbox is in the wetland seaway lock museum as his descendant was involved in the fire department there..also a Harly Johnson was involved in local parades riding a small cart, this range is 1870 to 1970 and looking if there is any remaining houses that were the original Johnson, James’ or the Boyles, including a Nettie Boyle an unmarried relative who lived in or around the Duke Street Area or in the area of the original Johnson farmlands in the montebello park lands area. Does anyone have photos of the old bus station during the 60’s? I am looking for info and photos of Lakeshore rd. in St. Catharines. Old family homes between Geneva and Lake if possible. 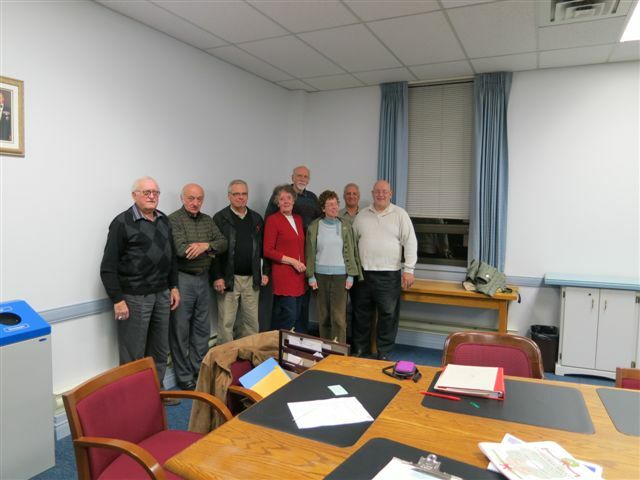 Im looking for photos.of 3 St Catharines groups and hope you can assist. I’m looking for photos of the following St. Catharines area Drum Corps that were active in the 50’s 60’s. Port Dalhousie Guardsmen,Merritton Grenadiers,Merritton Buccaneers,44th RCA Trumpet Band,Lincoln and Welland Bugle Band. Marla Giffin. I am trying to find out about my neighbourhood I grew up in. My mom & dad built on Coronation Blvd in 1957. They left the last pear tree up from “Fawell Farm”. I tribute to the farmland. My dad passed in 1978, my mom now in nursing home. So interested in the Martindale area. Do you have any pictures or info. I’m still living in the area. So currious! Also all the little cottages in a horse shoe around Vansickle Rd. N, and grapeview Dr. Heard that there was a man-made lake there and I “Summer resort”. for alot of Americians? Can you find out anything for me. looking for any info on the O’reilly house and or old photo’s on Edmund street in St.catharines. Looking for an image or images of the Old Downtown YMCA. Fond memories and trying to “see” it again. Try checking at the Centennial Library downtown! I believe Trish Romance painted a picture of the above with children walking in front. i am searching for info on the mclaren family of lake st.. they had a farm and sold a sesction to the city for the armoury.. i only have one document about the farm… would appreciate any info on this.. please…… they owned the house across from the armoury, where the caa now sits.. my dad planted the big tree out front.. he sold the property, in the early 60.s…….. thanks.. I was wondering what the Historical background of the “Chelsea ” building I think on William str near montebello park? Can you direct me to this information? I am trying to get access to old photos of Elizabeth St in St Catharines. especially between Lake and York. I hope you can help.